Though severely damaging North Vietnamese military-industrial infrastructure, this operation was a US strategic failure. 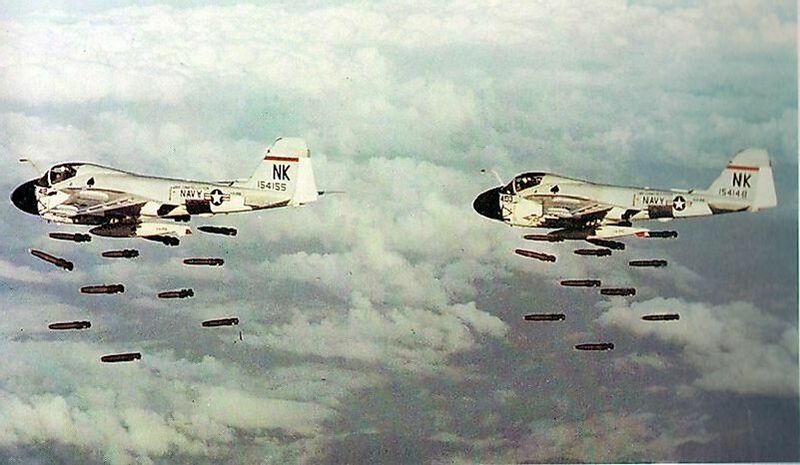 U.S. Navy bombers wreaking havoc on North Vietnamese areas of strategic importance during Operation Rolling Thunder. As soon as the United States joined South Vietnam’s ongoing fight against their Communist neighbors to the north in the early 1960s, they began compiling lists of the transportation, manufacturing, and military bases most integral to the North Vietnamese defense system. Operation Rolling Thunder was a famous campaign in military history, meant to destroy many of these important North Vietnamese facilities. which was the bombardment campaign conducted by the Seventh Air Force, U.S. 2nd Air Division, U.S. Navy and the Republic of Vietnam’s Air Force (VNAF) against North Vietnam. This extensive operation began on the 2nd of March, 1965, and it did not end until the 2nd of November, 1968. The campaign was initiated with the aim of undermining the North Vietnamese populace’s daily functions and the capacity of its government to govern them in mind. The attackers in the campaign were constituted by a combined force of U.S. Air Force and South Vietnamese Air Force (VNAF), in coordination with Thailand, from where they launched many of their attacks. The anti-Communist aerial barrage was led by South Vietnam’s Nguyễn Cao Kỳ, and U.S. Air Force commanders Joseph Moore, William Momyer, and George Brown. The North Vietnamese Air Force defenses were led by Phung The Tai and Nguyen Van Tien, and were greatly assisted by Communist allies North Korea, China, and the Soviet Union. On the 2nd of March, 100 US and VNAF (Sotuh Vietnamese Air Force) planes attacked and bombed a base at Xom Bang. This bombing was meant to last for only eight weeks, but it ended up lasting until the 2nd of November, 1968. The U.S. military, with the South Vietnamese at its side, had a handful of main objectives in this operation. These objectives were the destruction of the North Vietnamese industrial infrastructure, incapacitation of its air defense bases, and paralyzing its transport system, so as to stop the flow of materials and men into South Vietnam. On the 8th of March, 1965, combined anti-Communist forces, including 3,500 specialized U.S. Marines, arrived at Da Nang to defend the Southern airfields. The mission was to expend the combat operations on the ground and aerial campaigns. During the attacks that followed, more than 170 U.S. aircraft had been lost by the 24th of December. The counts released included 85 from the Air Force, and 94 from the Marine Corps and Navy. The South Vietnamese Air Force had lost 8 air craft too. 25,971 sortie- and bomb-capable aircraft crews had flown, and dropped 32,063 tons of bombs, with 11,144 tons having also been dropped by Navy outfits. The South Vietnamese Air Force had unknown tonnages that had backed up to 682 missions. The greatest result of the opening fact in the operation was Viet Cong forces confronted the US air base in South Vietnam. Westmoreland, the commander of the U.S. troops could not defend the base with 23,000 men under his command. Even if the President of the U.S. then sent 3,500 more troops to South Vietnam, the base was still overturned. The bombing of North Vietnam caused great havoc and there was need to restore the North. The leaders of North Vietnam took a number of steps to impact the U.S. bombings. They build up networks of bombproof tunnels and shelters. They rebuild roads bridges and dispatched troops by the night. The Communists also used the destructive air strikes to facilitate their propaganda. The losses involved in the campaign were astounding on both sides. Although the North Vietnamese suffered more than one-third of a billion dollars in direct damages, lost tens of thousands of civilian lives, 18,000 soldiers’ lives, and 120 aircraft, as well as 14 North Korean pilots killed while supporting them, Operation Rolling Thunder is considered a U.S. strategic disaster, as little was achieved relative to what the U.S. lost. The United States had more than 1,000 servicemen either wounded, killed, or missing in action, and lost almost as many aircraft. The South Vietnamese lost many as well, though their official numbers are not readily obtainable or reliable. Operation Rolling Thunder several many months, over which time 643,000 tons of bombs were used and almost 900 US aircraft were lost. There was a huge financial cost used in the operation that was estimated to be around $300 million in the North Vietnam and almost $900 million was the estimated amount for the US. Operation Rolling Thunder was put to an end when President Johnson offered negotiations as a means to end the war and secure the North Vietnamese. Operation Rolling Thunder, one of the most famous engagements in the history of the “Americanized” period of the Vietnam War, came to an end after negotiations gave way to a mutual agreement to conclude it. The North Vietnamese and their allies had proven a formidable match in the air for the U.S. and South Vietnamese. Many have contended that the U.S. military leadership had failed to adequately organize this campaign in North Vietnam, due to the underestimation of the aerial capabilities and the extent to which their allies would facilitate their defenses from above. The multinational involvedness and technological advancement of the aerial warfare led to the engagements in this campaign becoming infamous, listing among the most amazing (and dangerous) aerial warfare spectacles ever witnessed. Due to the inherent complexity of the aerial sorties that defined this operation, the Navy implemented the United States Navy Strike Fighter Tactics Instructor (a.k.a. TOPGUN) program. Lessons learned in Operation Rolling Thunder did not, however, allow for a decisive victory for an even larger U.S. aerial campaign to come: 1972’s Operation Linebacker.